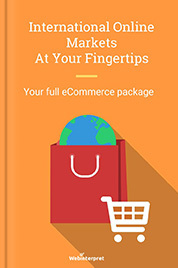 What can multiply your online store’s international revenue in the simplest and fastest way? 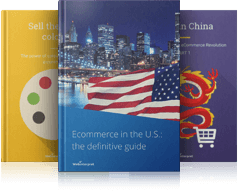 What does it take to sell on international online markets and have thousands of orders placed at your checkout? Answers to these questions are gold for many online sellers, both large and small. To expand internationally, an obvious starting point would be to translate your ecommerce website / product pages. However, this is just the beginning. To multiply your revenue on foreign markets, you need a solid localization strategy. This goes beyond submitting texts to translators. Localization is also about currency and size conversion, communication with foreign buyers, legal restrictions, local marketing & SEO or international shipping. 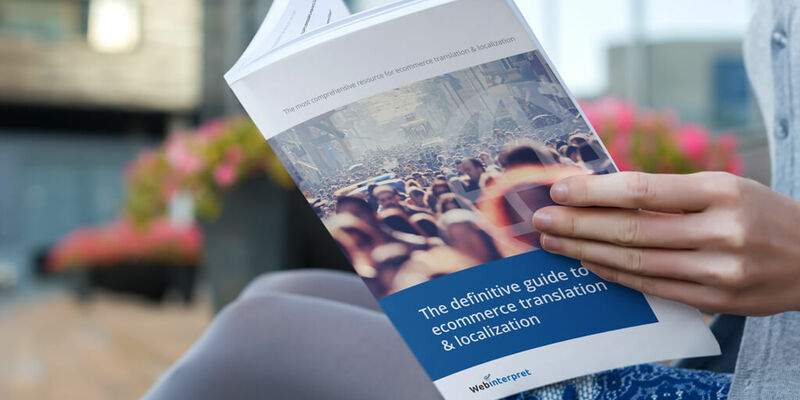 This guide will give you insights into ecommerce localization and how to go about it to ensure success and multiplied sales figures. 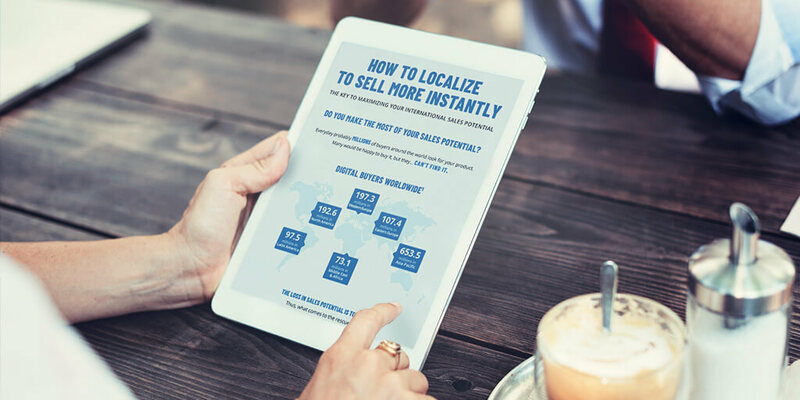 To find out how to translate and localize in a way that sells, download our FREE ebook! Can you translate and localize your online store by yourself? This comes down to a question of capacity and return on investment. In theory, sure, you can try to translate and localize by yourself. In practice, it can be time-consuming and risky. First, managing even a modest inventory across multiple markets and channels becomes unsustainable almost immediately. Second, rarely are sellers sure that the end result of their own attempts at ecommerce localization will be of good quality and will bring them orders from abroad. The bottom line: product catalogues are big projects to manage so you’ll need time, money and patience. If you want to experiment a bit, give yourself a chance. However, if you’d rather spend your time and money on the development of your business, consider automation. Many sellers have learnt, sometimes the hard way, that automation is the only realistic, sustainable and scalable approach to localization. 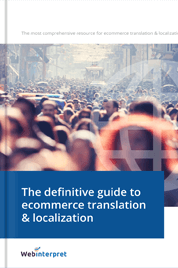 Ecommerce localization goes beyond simple translation. Localization is a broader term that describes all aspects of preparing your online store for growing international sales. The objective is to provide international buyers with an online shopping experience that is indistinguishable from their normal native experience. This way merchants can compete on a level playing field with local competitors. Taking care of restrictions and the legal side. To give you an example: if you sell clothes, you must translate product attributes, but also localize sizes and currencies. Size 8 in the UK may be 4 in the USA and 36 in Germany. Brits will most likely want to pay in pounds, Americans in dollars and Germans in euros. You must take care of these localization aspects. Country/culture specific: different countries, different markets. When in Germany, sell as Germans sell: in their local language, currency, using their favourite payment methods, etc. Merchant specific: merchants, especially bigger ones, may describe and market their products in their own ways, sell their own brands, use specific brand names, color descriptions, conversion tables or use a special writing style and industry vernacular. Platform/channel specific: different ecommerce platforms (eBay, Amazon, Shopify, Magento, etc. ), different rules. Each platform has its own content structure, text formatting and eligibility rules. Proper category and filter mapping must be ensured. Product discoverability: successful localization will make your products easy to find on foreign markets. Conversion: successful localization will increase your conversion rates, e.g. 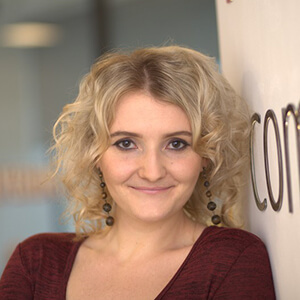 by making your buyers comfortable with the (localized) checkout process. Buyer satisfaction: successful localization will make your buyers happy with their orders, eager to come back to your store and/or spread the good word about your brand. Returns: successful localization will decrease the number of returns. At Webinterpret we translate and localize online stores and marketplace listings so relevant buyers are able to find your products and order from you. As a result, you generate revenue. In such cases we see localization as successful. What if your business needs exceed the daily 2,000 word limit? What if your budget is limited? What if you need ecommerce-specific translations in a few languages? Well, human translation may not be necessarily the best return on investment for your ecommerce business. Why? Human translation is often slow and expensive. It can be inconsistent and may not match the ecommerce context. It can cost you money, but also a loss in sales potential. Let’s assume that a human translator gave you a quote of $0.10 per word. An average product listing consists of around 100 words. If you have 1,000 products to be translated into 4 languages, it will cost you around $40,000. Depending on how often your inventory changes, this is a cost you may have to incur every season. Without an automated solution, it’s time-consuming to keep up with frequent catalog updates, especially in multiple languages. In today’s ecommerce world speed counts so it’s essential for merchants that new products and product updates are translated automatically. But humans are at least accurate! You may say. You may actually want perfect, even poetically beautiful, translations of your listings. Well, our response would be: be careful right there. Will your potential buyers want to appreciate the literary value of your listings? Will they demand word-for-word accuracy? Unlikely. Online buyers want great product offers, not breathtaking product descriptions. So you don’t need to prove that there’s a bunch of linguists behind every text you produce. If successful, i.e. growing your sales, ecommerce translation & localization is your goal, don’t waste your time and resources on breathtakingly correct listing translations. You translate & localize to grow your sales. Period. make your products easy to find on foreign markets. Thus, the right keywords and clearly listed attributes are the core of optimal ecommerce translation. Further, if you expect human translation to be error-free, there’s a very old saying that still rings true: to err is human. A human translator can specialize in fashion terms, but may be totally confused about car parts. On top of this may come the necessity to convert sizes and translators may not be … proficient in international conversion charts. Not to mention the fact that different translators can translate the same terms differently. All this can result in confusion, inconsistency, faulty translations, returned products and keywords not entered in search boxes. Thus, always appreciate human knowledge, but never underappreciate machine capabilities and consistency. Ecommerce translation takes brains, but here’s great news: today Artificial Intelligence (AI) makes machines much more human than they used to be. The best translation from the linguistic perspective may not be what people actually search for online. Thus, to make your products easy to find on foreign markets, think like a potential buyer, not like a dictionary. For instance, das Handy is the translation of a mobile phone from English into German. However, Germans may not enter das Handy to buy a mobile, but rather Android, iPhone, smartphone and so on. It’s also worth mentioning filters. 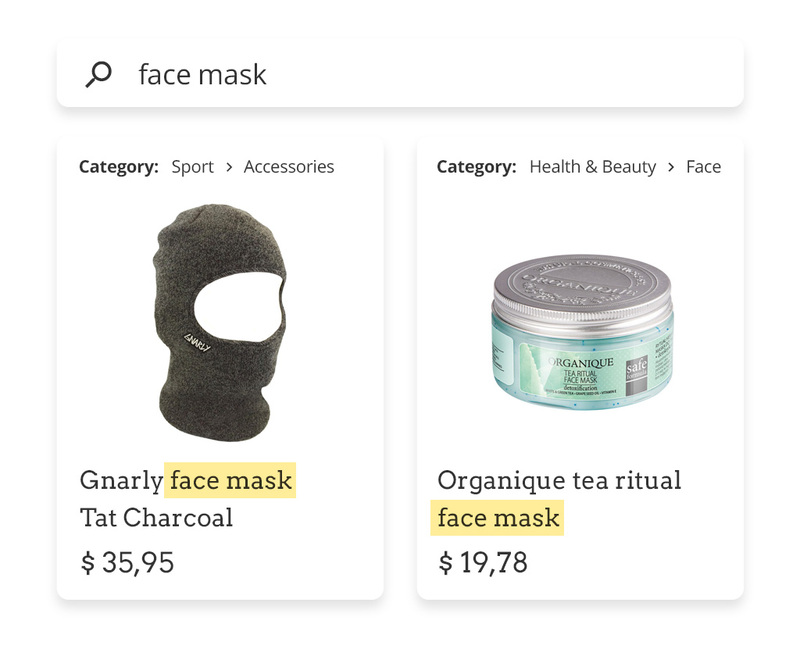 eBay and Amazon use special filters to help buyers find the product they’re looking for. Buyers can filter by size, color, style, brand, etc., so that search results show only the items with values selected by the buyer. To improve listing visibility, let’s say on eBay, translation should take place according to eBay filters. Ecommerce localization should also account for that. At Webinterpret we take into account marketplace filters. Moreover, when localizing offers on foreign markets, we consider our customers’ results, such as the searchability of products, conversion rates and the number of returns. Keywords help to make sales so we localize our sellers’ listings accordingly. We believe in a simple rule: translate and localize in a way that sells. At Webinterpret we want to know which keywords are searched for most often in particular categories, generating most sales. An example will explain it best. Let’s take the translation of repair kit into German. 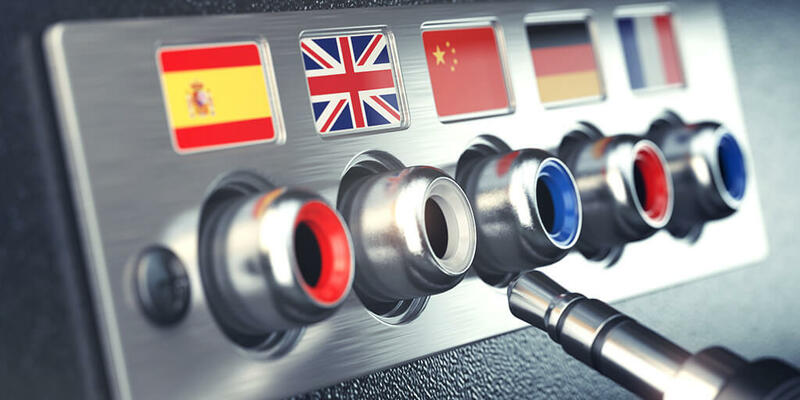 There are a few correct keyword options that German speakers can use when browsing for this product: reparatur kit, reparaturset, reparatur set or reparatursatz. According to our analysis, the most successful listings included reparatursatz. We also found that this option was usually entered when buyers browsed for a repair kit in the Auto / Motorrad category. Such keyword-search patterns should be observed on a regular basis to see which keywords are trending in generating sales. Further, ensure that keywords in titles are the words commonly used on ecommerce platforms and are domain-specific vocabulary. Remember that keywords in titles count manifold. Consider potentially different lengths of translated titles. For example, eBay allows 80 characters in titles. The English title may be 80 characters long, but its German translation can amount to 120 characters. So which word to drop to maximize conversion? Unfortunately, Google Translate won’t take care of this aspect, but it’s essential to do so for a few reasons. First, some information is specific to a source site, e.g. shipping or price, so it makes no sense to display it in the title on a target site. Second, removing redundant information from titles belongs to best practices shared by eBay and Amazon. Third, the number of characters per title has limits (80 for eBay), which is again something that Google Translate doesn’t know and may remove important keywords instead of punctuation. This is what we’ve addressed at Webinterpret. We remove redundant words and expressions from titles, i.e. words that have no impact on the conversion rate. … redundant information that can’t be reused for target countries, e.g. price/currencies, delivery and shipping information that will vary for different countries. … expressions which are duplicated in item specifics. … but It’s not about standard automated translation. Using Google Translate and standard translation tools for your ecommerce listings/store can result in a big mess. Take brand translations as an example. If you sell recognized, tier 1 brands, there’s a chance that translation tools will pick it up from the context. For example, there should be no overtranslation of the brand Apple into Apfel for German buyers and into Pomme for French buyers. Similarly, if brand names are non-existent words, e.g. Adidas, they shouldn’t be overtranslated, either. It gets tricky with Nike. There are Nike sneakers, but there’s also a goddess named Nike, which may confuse the tool. This can get even trickier if you sell general, smaller or less known brands. It’s a real issue as many listing titles contain brand names. We checked at Webinterpret how many product titles contain brands, models, or manufacturers. The analysis was based on a sample of thousands of British and American online stores. 32% of 1.4 mln product titles we analyzed contained brand, model or manufacturer names. There’s a high risk that these names will be overtranslated. Mistranslating names in your product titles is definitely not what you want, and Google Translate and similar tools won’t be apologetic. Thus, it’s highly recommended that you use a solution optimized for ecommerce. For example, Webinterpret’s Online Stores has been designed to handle the translation of general brands, models and manufacturers correctly. We look into our catalogues to avoid overtranslating brand names. We also allow merchants to provide their brand names and tailor their translations. Now let’s discuss sizes and dimensions. It can also get messy if they’re translated incorrectly or not translated at all, which can significantly increase your return rates and decrease your seller ratings. We checked how many eBay items contain sizes: it’s around 22% of items in the Clothes category per month. 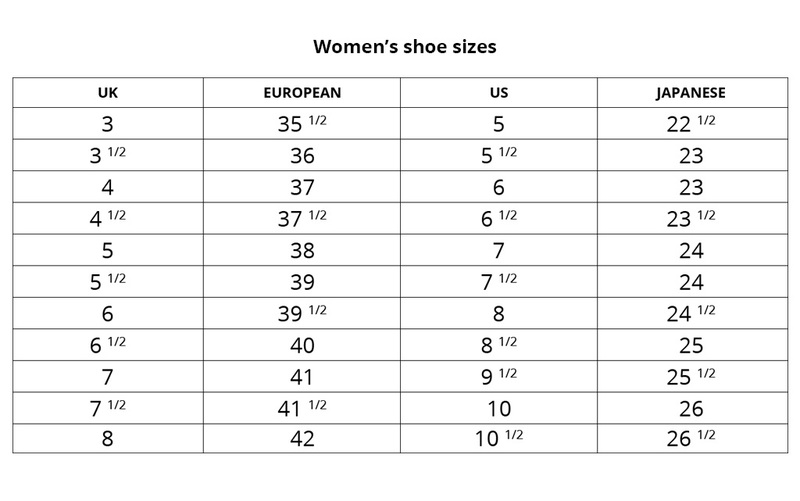 Sizes are common for products from the fashion category, e.g. shoes, accessories or dresses, but also for various objects, such as figurines or car parts. Different countries, but also manufacturers and individual sellers, can use various metric systems. Thus, we need conversion charts indicating relations between sizes. Consider this. If you’re a British merchant selling shoes in France, size variations UK 7, UK 8, UK 9, UK 10 won’t be translated by Google into FR 41, FR 42, etc. If French buyers are confused by unfamiliar sizes, they’ll probably abandon the shopping cart. Thus, Webinterpret provides the ability to translate sizes and also offers customised size conversion for eBay sellers, which isn’t supported by Google. We have over 700 default manufacturers’ charts and around 12,000 custom sellers’ charts. Size translation is configurable by individual merchants and sellers can declare if they want to translate. They can also provide their own translations (particular brands will have their own conversion charts). Dimensions are any numbers followed by units, e.g. inches, centimeters, kilograms, etc. We’ve identified different patterns, for example Ø 350 x 25.4 mm, 500kg, 0.5m 1m 2m 3m 5m 7.5m 10m. We convert around 7% of eBay items containing dimensions per month. Google doesn’t support dimension conversion at all, but it’s very important from the buyer experience perspective. If buyers don’t recognize the metric, they may not bother to look this up and will choose a listing containing familiar sizes. Note that in some eBay categories there are restrictions, depending on the conversion and type of product. For instance, we can convert inches into centimeters, but in the case of TV’s or computer screens, inches will be kept for all sites (European and English-speaking). If there are brands, sizes or dimensions in your listings, don’t leave them to standard translation tools. Wrong translations can cost you lost orders and returned products. Ecommerce-optimized machine translation is an efficient, effective and affordable alternative to human translation. It differs from standard machine translation as it’s built and trained specifically for ecommerce products. It understands the notion of products, attributes, categories and context in a way that standard machine translation cannot. Let’s take context as an example. Context enables natural language processing to understand products in a way that standard machine translation cannot. For instance, the translation of a ‘face mask’ will depend on whether it sits in Health & Beauty or Sports Accessories. Webinterpret’s AI-based, natural language processing solution will help you optimize your localization processes and costs, ensuring the best return on investment for your online business. Our proprietary Ecommerce Localization Engine enables us to automatically create localized ecommerce sites for thousands of merchants and offer it as a free service. We offer a full localization package for online store owners: we take care of all translation, price and size conversion, legals and even international shipping. Our solution is perfectly integrated with the top ecommerce platforms, such as Magento, Shopify, Woocommerce and BigCommerce as well as marketplaces (eBay and Amazon). In short, we take care of your international sales and you can focus on the development of your business. Standard translation of your ecommerce store/listings is not enough to maximize your conversion rates abroad. 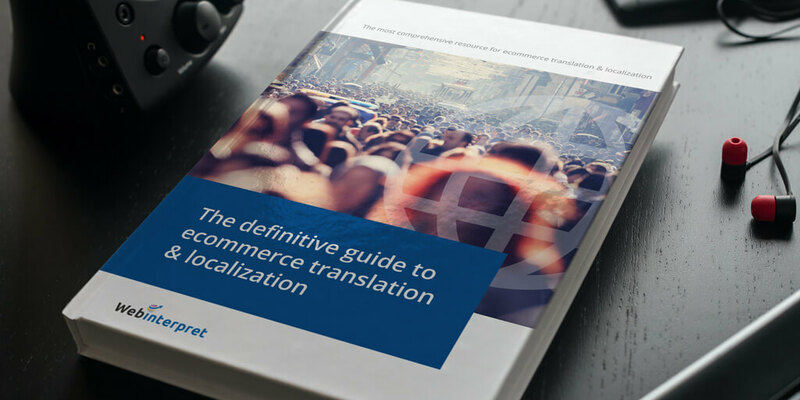 First, the translation of your store should be ecommerce-optimized. Second, many components of localization, beyond translation alone, must be optimized, too. Fully localizing your products and/or website is fundamentally important if you want to get the best results. 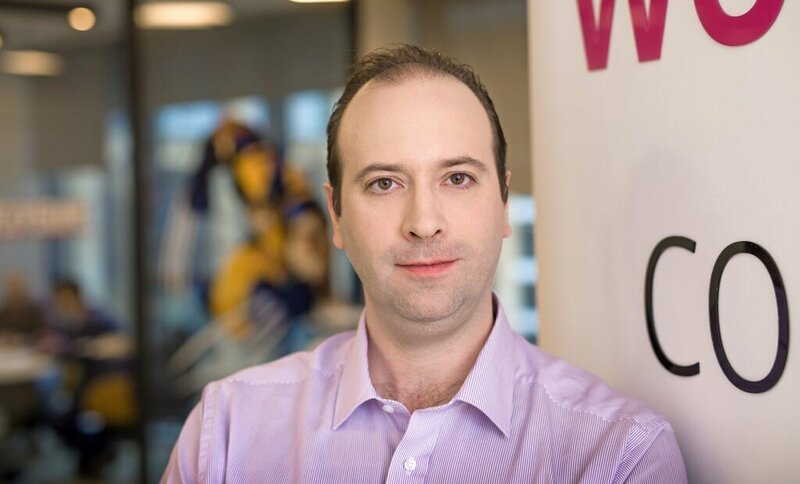 Localization is about overcoming barriers for the buyer so that purchasing is a straightforward process. Luckily, with today’s technology, it can take just a few clicks to localize your store and … you don’t need to be a developer to master that. There are probably (tens of) thousands of international buyers interested in your product. However, you must help all those buyers find your online store/ product pages and let them enjoy their purchase experience with you. What’s in it for you? More revenue and maximized sales potential! To access the FULL guidebook, click below to download it for FREE!